IIFT 2016 exam was conducted today. I have had a chat with of few of my students and there seems to be some errors in the paper, specially where the Logical Reasoning part is concerned. Also, the paper was tougher than last year which might cause the cutoffs to dip. I will probably write a slightly more detailed post on it tomorrow. For now, I would like to focus on the General Knowledge section. The paper was relative easier than last year. Perhaps couple of populist questions on movies made it that way. Some of the questions on Bitcoin and elected posts in Indian government also made it on the easier side. The match the following questions were also a little bit easier than usual because of easy matching of couple of options. There was an obnoxiously long question (Q 13) where a brief biography of three people was given and you had to pick the three from the 9 available. I think it would have been better if you had just skipped that. It isn’t worth the time or the effort. I believe the cutoff would definitely be higher than 0.82 of last time. It might go up to as high as 2-2.5. I doubt it would go beyond that. 5 questions which I believe that everyone should have done (were easy): 2, 19, 20, 23, 25. If you have done these, you will clear the cutoff. Do try out our online General Knowledge course if you are planning to take SNAP / XAT / CMAT or other exams that ask for General Knowledge part. 1. The Trans Pacific Partnership (TPP) or Trans Pacific Partnership Agreement is a trade agreement among twelve Pacific Rim countries, signed on 4 February 2016 in Auckland, New Zealand. Which of the following countries is not a member of TPP? Note: Sitter. Probably the easiest one of the lot. Everyone would have done this pushing up the cutoff. 3. Which of the following best represents the baking soda. Note: Not a sitter but not difficult. 4. Which of the following country was not there in the UEFA Euro 2016 (sports tournament) quarter-final? Note: This was hard. Although a question on people who died in 2016 was expected. But Alvin Toffler’s most famous book is perhaps Future Shock or Third Wave. 6. Which of the following Indian States share border with multiple countries. Note: An easy way to do this would have been to pick up the obvious choices. Sikkim is sandwiched between Nepal and Bhutan so it has to be a part of the answer. F and E are common to three options. If your Geography is really good, you would have known that the other two are Mizoram and Assam. Tough. Very Tough. 7. General elections were held in Myanmar on 8th November 2015. This has been first openly-contested election held in the country since 1990. Which political party won the highest number of seats? 8. Sustainable Development Goals have replaced. 9. Match the following Organizations with the location of its Headquarter. 10. What was the theme of the 2016 National Youth Festival of India? Note: WTF! Which festival is this? I had no idea. Better to skip it. 11 Which Indian player has created junior world record in “Javelin throw” In July 2016? Note: Not a sitter but once again should have been attempted. 12 which global credit information company is associated with Credit Information Bureau (India) Limited (CIBIL)? Note: Easy. Their ads are quite frequent. Also, if it was Moody’s or S&P or American Express – you would have known and remembered. By elimination, you should have marked D.
14. What is the currency of Bulgaria? 15. Bharat Heavy Electrical Ltd. Commissioned 2 units each of 14 Megawatt at the Salma Hydro Electric Project in 2016. Identify the country where this project is located. Note: Not a sitter. Should have been done. Was all over the news when it happened. Modi visited Afghanistan as well. 16. “Satyameva Jayate” inscribed on one side of all Indian Currency, has been derived from which of the following ancient Indian scripture? Note: One of those questions whether you know it or not. Clearly Rigveda and Ramayana are not the answers. The presence of ‘None of these’ made it confusing. 17. Which country inaugurated the first electric road in the world for hybrid heavy transport? 19. Which of the following has acquired Jabong in July 2016? Note: Sitter. Everyone would have got this. 20. Match the movie personality on whose life it is based. Note: Sitter. Because of the options and matching. Social Network is obviously Zukerberg bringing down the option to B or C. After that, it is kind of obvious that “The Lady” would be based on Aung San Suu Kyi and not Tony Blair. 21. The 2016 Joint military Exercise “Maitree” has been conducted between India and which of the following countries? 22. What is director identification number (DIN)? b. A number which the Central Government allots to any individual intending to be appointed as director or to any existing director of an company. c. A number which the SEBI allots to any individual intending to be appointed director or to any existing director of a company. d. A number which the Central Government allots to retired directors so as to enter in data base. Note: People who have prepared for CA / come from commerce background would have gotten this easily. Also, even with a little bit of common sense A and D can be eliminated because those would not form a standard practice. C can be eliminated because SEBI is for stock market regulation leaving B as the obvious choice. 23. Which of the following is not an elected post in India? Note: Sitter. I would be surprised if anyone got this wrong. While PM and CM are obviously out, I guess most people would know that President of India is indirectly elected and Governors are appointed. c. A type of currency used by Paytm. d. A type of commemorative coins issued by Mints. Note: Doob maro if you did not know this. Note: Sitter. I guess all of us have seen enough movies to know that Shahrukh was in Deewana. Rest of it is pretty obvious as well. But sir I have to say, I have used your course for the second time. 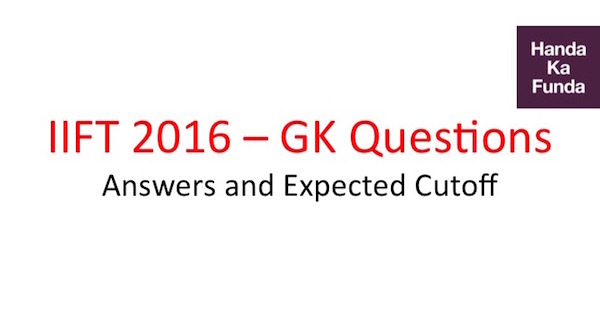 But course has failed both times(iift 2015 and 2016) to predict questions. What I have tried to do in the course is cover the topics that are important in my opinion. Sometimes we go in depth and sometimes do a superficial overview of the stuff. While there are hits and misses, clearly we missed more than hit this time. My main goal with this course has been to provide a high ROI based on the time invested. Not covering all currencies (like Bulgaria) was done so that students don’t have to cram unnecessary information. As a matter of fact, it would have been easier for me to just post the entire lists without filtering out information. This ideology didn’t work this time and I am disappointed by that as well.